With over 500+ retail stores and gas stations located across the Mid-Atlantic, Cumberland Farms today is one of the largest privately held companies in the world with revenues of over 16+ billion annually. With so many locations and over 6,000+ employees, trying to compile and organize the data from each store in a timely manner was becoming almost impossible. Each location was filling out any combination of paper time sheets, work orders, facility inspections, store inventory sheets, and more. 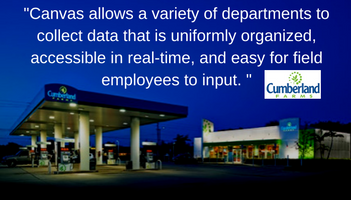 In addition to the mounting piles of paper forms and slow collection times, Cumberland Farms was motivated to reach out to GoCanvas about switching to mobile forms in order to reduce operational costs, increase revenue through greater productivity, and to increase the visibility/accessibility of data within the organization. Across the Cumberland Farms organization, the Operations, Safety, and Maintenance departments shared the same issues when it came to paper. They weren't able to easily collect, share, and learn from the data that was being captured at their hundreds of locations across several states. Nothing was being processed in real-time, and their paper process was only getting slower as their business scaled larger and larger. Given these issues, GoCanvas Senior Mobile Consultants worked with the team at Cumberland Farms to start developing a success plan to transition their locations from paper forms to mobile forms. The first part of the plan consisted of identifying which forms were a critical part of the data collection process at Cumberland Farms, and to begin transitioning these forms into the GoCanvas mobile platform. The first couple of forms consisted of Part Inventory, Guest Experience, and Parts Request reports. Once these mobile forms were completed, Cumberland Farms identified a group of "pilot users" to test out the new paperless process and compile all feedback --- positive and negative. This feedback was then incorporated into each mobile form using the no code, drag and drop GoCanvas app builder. The forms were so easy to create and edit for Cumberland Farms that they have since built out over 20+ different types of mobile forms! “Coming from a company where everything was on paper, GoCanvas is easy to pick up and very efficient to expedited work orders, parts, and time sheets." - Mike Krizan, Cumberland Farms, Inc.
With the mobile forms finally tweaked to their ideal usability, Cumberland Farms focused on making the back-office process even simpler. This included incorporating the Dispatch feature of Canvas, which allows staff to manage and assign tasks from the office to personnel in the field. This allows the office staff to track and review results in real-time, as well as re-assign inspections or reports that weren't completed on time. This has contributed to their reported 28%+ increase in productivity since deploying GoCanvas. Since fully deploying GoCanvas over 5 years ago, Cumberland Farms has collected well over 145,000 digital reports and reduced their paper costs by $11,000 per year. They also saw a full return on their investment within 6 months of fully deploying GoCanvas to their field teams. All of this, as well as their dramatic increase in productivity, lead to their recurring ROI of over $400,0000 with GoCanvas.